‘Tis the season for year in review posts. I didn’t write one of these last year. I thought I would change things up and cover the highlights of our year in reverse. This Christmas was number 25 for Andrea & I. We had officially met 2-3 weeks before Christmas 1988. I gave her roses that year. 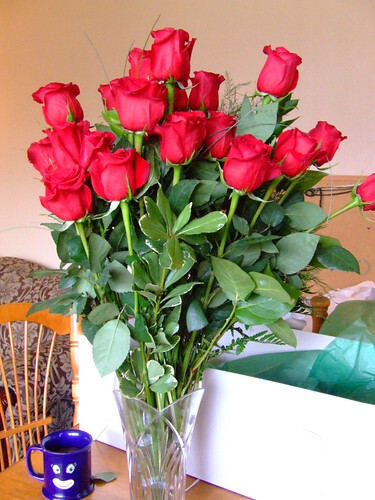 This year I surprised her with 2 dozen long stemmed roses for the 24th anniversary of officially meeting. I had a second romantic surprise for her on Christmas Day which was a sterling silver pendant with a birth stone for each of the children and grandchildren. Click through for the rest of our Christmas fun. In October, Andrea & I attended the WordPress Community Summit on Tybee Island, Georgia. It was our first WP community event since WordCamp Toronto in 2011. It was awesome to get together (again in many cases) with folks that we work with online in the WP Community. Early in the year Meaghan let us know that she wanted to move to Fredericton to look for work. We rented a place for her so that she would be within walking/bus distance to business/retail areas of the city. She’s been enjoying a job at Costco for about 3 months. Once Meaghan let us know that she was planning on moving out we started thinking about 3 of us living in a five bedroom, three bathroom house with two stairways and when it would be time for us to put it on the market. We decided we wanted to start the final renovations right away. We rented a storage locker and started working our way through all of our stuff. We ended up splitting our possessions into three categories: need to keep with us, want to keep but don’t need right away & we can part with this. Moving the things we wanted to keep but didn’t need right away to a storage locker made things easier for us in a few ways. First, those items were the easiest to pick out (ex. Christmas decorations). Second, it gave us space for both renovations and sorting through the remaining stuff. Finally, it helped crystalize the line between this is something we want to keep and this is something we can part with. One of the renovation items that had been on the list since we bought the house was cleaning up and painting six tin ceilings. Tin ceilings need an initial coat of metal paint before being painted with regular house paint. Because metal paint is solvent based, it’s not safe for breathing. That meant that we would need to vacate the house while the metal paint in each room was curing. Given that we work at home that was going to be rather disruptive. We decided that a workable solution was to rent a place for Meaghan that was big enough for all of us. We rented the place we have now in Fredericton and had fiber optic Internet installed. Within a couple weeks we realized that the speed of our Internet connection significantly improved our work environment. By the end of June we had pretty much switched over to spending the entire work week in Fredericton. In March we went to our first SxSW and met the rest of our Copyblogger co-workers. both andrea & I love the autonomy of working for a distributed company but there is no substitute for meeting up the people you work with. We have already booked our flight and hotel for SxSW 2013.